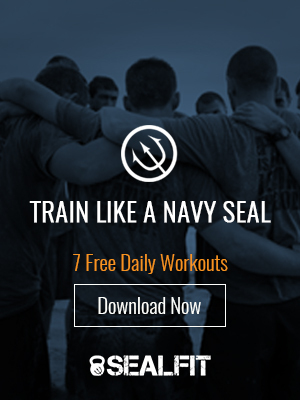 My experience as a Navy SEAL triggered a sea of change in my perception about the potential of human performance. For starters, being one of the 40 out of 180 in my class who survived Hell Week provided a new reference point for what the human body could handle in terms of a relentless onslaught of physical and psychological demands. Indeed, it was during Hell Week and the crucible that is the BUD/S training program where I came to understand how the Warrior Spirit is forged through the merging of heart and mind with each and every action. Reintroducing a warrior-monk style of training to the West appeals to me. You learn fast when you engage your whole person. You develop at the physical, mental, emotional and spiritual levels. “My spark is lit,” I wrote. I went on to design and test the first Academy, with a game plan to offer the immersion-style training to others. Whether you’re doing SEALFIT, CrossFit, or some other training regimen, I want to encourage you to make time for and commit to this type of immersion period where you can confront and break through any psychological barriers that may be slowing down your progress. Again, whatever method of training you’re employing, I have another dimension of training that I encourage you to attend to on a daily basis. In a way, it’s the yin to the yang of smashing your way through physical and mental barriers. It’s called durability, and it’s a key ingredient in the SEALFIT program. A foundation of durability is what will enable you to obtain your optimal performance capacity and to sustain it over a lengthy period of time. You don’t make it through BUD/S without mustering the durability to make it through the entire nine-month series of challenges. As you can imagine, durability is critical to a Navy SEAL. Essentially, it’s the ability to “Stay in the Game.” You’re no good to the team if you get hurt before a mission. Even worse is sustaining an injury during a mission, as you instantly become an outright liability. Another facet of durability is psychological: if you burn out or lose motivation, you’re on the edge of being a liability to both the team and to yourself. It’s when your focus flags and drops that most injuries and accidents occur. The torso houses the major engines of the human body, where you produce the power and energy to flow through the extremities (the arms, legs, hands, feet). Building strength in the torso, aka the core, is how you take yourself from being a V6 to a V8 (and beyond). We do this through functional movements under load, like squats, deadlifts, Olympic lifts, and sandbag work. Sandbag work, by the way, is exceptionally effective in this department, as the unstable, awkward nature of using a sandbag for various squats and lifts helps in the development of rotational core strength. Last time I checked, a sand bag costs about ten cents, so there are no financial impediments to starting your durability work today. Attention and focus on sustaining good range of motion throughout the joints is a key (and often neglected) aspect of being durable over the long haul. By all means pour your heart and soul into a high-intensity training session, but invest time in a mobility or Warrior Yoga practice to maintain or improving range of motion and tissue health. Failure to do so can trigger a slide toward muscular imbalances and injury. Not to mention a drain on performance. Being mindful of how you can use your gear, tech, and supplies toward injury prevention is going to net you big durability gains. If you have, for example, a pull-up challenge workout coming up, or a long ruck, start thinking now about how you can prepare to take care of your feet for the ruck and hands for the pull-ups. Simple stuff, but often overlooked. Attend to your baseline hydration needs throughout the day (shoot for half your bodyweight in ounces), particularly when it’s hot and humid. And don’t blow off your pre- and post-workout protein snacks to take advantage of your body’s metabolic windows that allow for complete recovery and restoration. During a hard training phase, build in adequate easy days and off-days to allow the body to digest all the work being performed. The result is an enhancement in your durability. Although it’s often impractical for special operators, getting eight hours of sleep each night is crucial to this process—this is when your body releases natural growth hormone. To ensure the best possible sleep, do your best to avoid caffeine, sugar and light from computer screens, smartphones, and TVs in the hours before you hit the sack. Doing so will help you get the deepest and most productive possible REM sleep that you can. Durability is highly underrated. However, it is what will take you from Point A to Point B without having a mental breakdown caused by stress, lack of confidence, or low perceptions of your performance. By taking these steps to build and improve durability, you will begin to notice a marked improvement in both your physical and mental health.